Subluxation is a term coined by the profession of Chiropractic. However, since it has been used and abused by other professions in their half-hearted attempts at describing a joint's position. The word subluxation refers to minor misalignments of bones in the spine or joint that lead to loss of wellbeing. It is that simple. Chiropractic-in-Malaysia wants to steps to ensure proper use of the term and a better understanding of what this term describe and how subluxations can rob years of your health. Subluxations are malalignment of the joints in our body can affect the ability to meet specific demands required for particular sports. Far too many are injured when they push their body beyond its' normal limits. Injuries sustained often result in subluxations. If uncorrected it can be the cause of continued pain or pain that revisits you time and again. The clinical teams of Chiropractic-in-Malaysia blog encourage everyone to get their spine and joints evaluated and assessed by clinical chiropractors or physiotherapists. Don't trust the unlearned or those with limitations. Visit the best there is, visit Chiropractic Speialty Centers in Malaysia. Sports injuries are common and almost every injury can be treated non-surgically. In this article, we will concentrate our efforts on injuries sustained during swimming. We picked swimming because it is an activity loved by all ages in Malaysia. Therefore, the best way to introduce subluxation and injuries sustained in a sports injury is through an activity known and loved by most Malaysians. No one is immune from a subluxation. It can happen to fittest and strongest of us. Swimmers have a higher risk of getting a subluxation in spine, shoulders, arms, hips or even in the knees. . Increased resistance, asymmetrical propulsion, and increased energy expenditure are the main limitations in swimming activity due to malalignment of the joints. Limited head and neck rotation to the right and side bending to the left may cause difficulty in alternate breathing on the right side for freestyle swimmers. The swimmer may suffer from neck and upper back pain due to increased tension in the right upper trapezius and limited neck rotation. 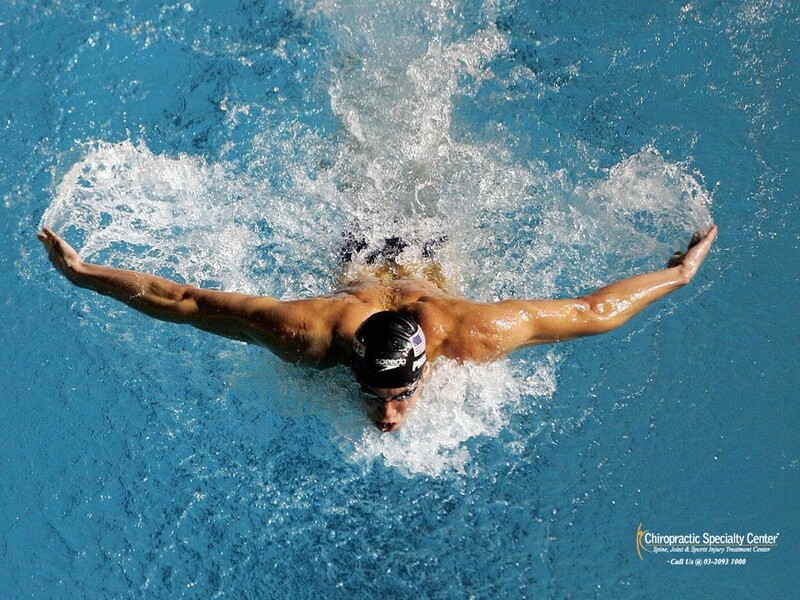 The swimmer may rotate the whole body to the right to compensate for the limitation of neck rotation. Decreased internal and external rotation of the upper limbs will affect arm entry and pull-through that cause asymmetrical propulsion and lift. Most of the injuries occur at the end of the restricted range of motion due to increased strain at the joint and surrounding soft tissues. For butterfly swimmers, decreased arm extension will be the primary concern as their arms will have difficulty clearing the water. They may have to torque their body for the arms to clear the water at the same time. The arm with restricted extension may have to pull with more force to achieve equal stroke strength. Torqueing of the body may create a ‘wobble’ that increase overall resistance. Side-to-side asymmetries in the strength of hip flexors and extensors can reduce the effect of forwarding propulsion. Common knee injuries due to malalignment include medial collateral ligament stress syndrome, patella-femoral compartment syndrome, medial synovitis and medial synovial plica syndrome. Avoid and fix subluxations through effective physiotherapy and chiropractic in Malaysia, our clinical teams can be reached at our main center; 03 2093 1000.